Surgical strategies in patients with bicuspid aortic valve (BAV), aimed at either correcting valve dysfunction, managing the BAV-associated aortic dilatation, or both, are diverse. Aortic valve replacement (AVR), with or without replacement of the proximal aorta, has been shown to be both effective and reliable in treating patients with aortic root dilatation, improving their prognosis and quality of life. It nonetheless exposes the patients to a variety of prosthesis-related complications. 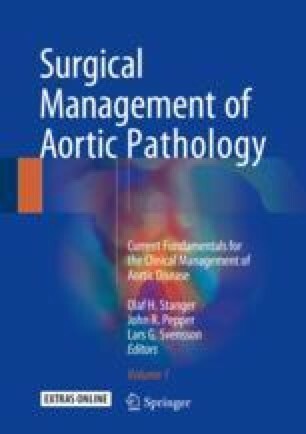 Alternatively, valve repair and valve-sparing techniques have been developed and evolved over the past two decades from an anecdotal approach to a plausible alternative to AVR in selected patients. In this chapter, we will review and discuss the currently available data regarding BAV repair failure, with a focus on the identification of preoperative, intraoperative, and postoperative echocardiographic and anatomical features associated with repair failure.